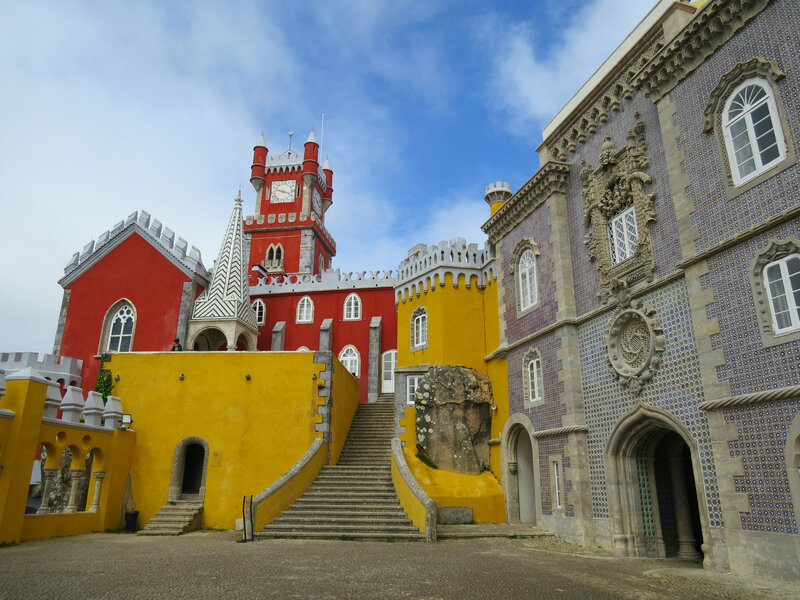 The Pena Palace sits at the top of a hill overlooking the city of Sintra. Starting in the 16th century, the site of the palace was occupied by a monastery. A series of natural disasters, including an earthquake and a lightning strike, severely damaged the monastery, and it wasn’t until the first part of the 19th century that Prince Ferdinand decided to convert the damaged monastery into a palace for the royal family. Ferdinand was fond of the romantic style of architecture that was popular during that time period, and he commissioned a German architect to build the palace using romantic themes. Arriving at the castle entrance felt like a trip to Disney World. The bright colors and unique architecture made the palace seem almost fake, like I was looking at a play castle instead of a real one. I even overheard someone commenting that the walls looked like they were made from spray painted foam blocks. Beautiful azulejos (painted tiles) are incorporated into the palace’s exterior walls and entrance ways, adding to the whimsical feel. 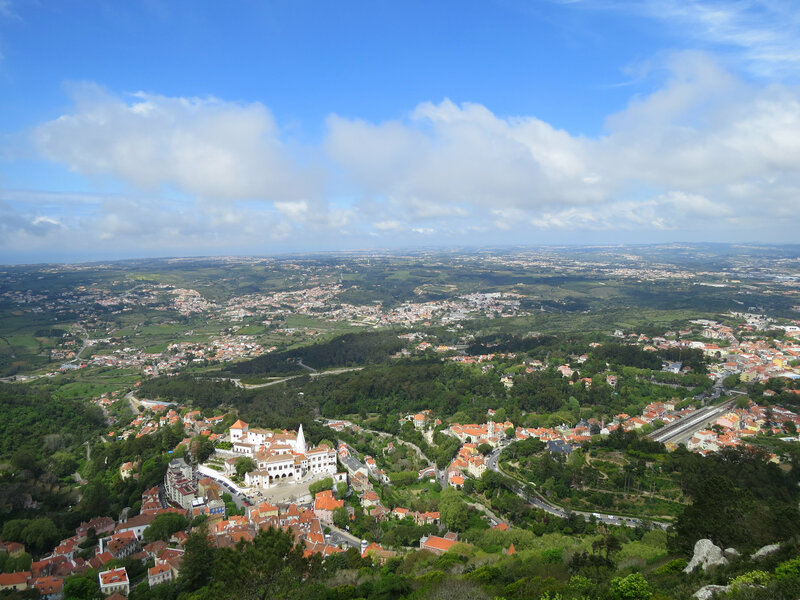 The views from the terraces and courtyards around the palace are phenomenal, and you can look down on Sintra and the some of the other beautiful palaces on the ridges below. After you’re done exploring the palace’s exterior, there is plenty more to see inside. Each of the interior rooms is intricately decorated with period furniture and artwork from the era. The Castle of the Moors was built in the 8th and 9th century by Islamic inhabitants of the region. The castle was eventually surrendered to Christian conquerors during the 12th century. Over time the castle fell to ruin, with considerable damage caused by the Lisbon earthquake of 1755. Restoration efforts during the 19th and 20th century have returned the castle closer to its former glory. I really enjoyed my time walking among the ruins. The views along the guard walls and the observation towers are spectacular. The castle is situated inside of a peaceful forest, and the colorful flower beds provided a pleasant aesthetic to the grounds. If you have more time in the area, explore some of the other palaces, such as the Monserrate Palace or the Seteais Palace.